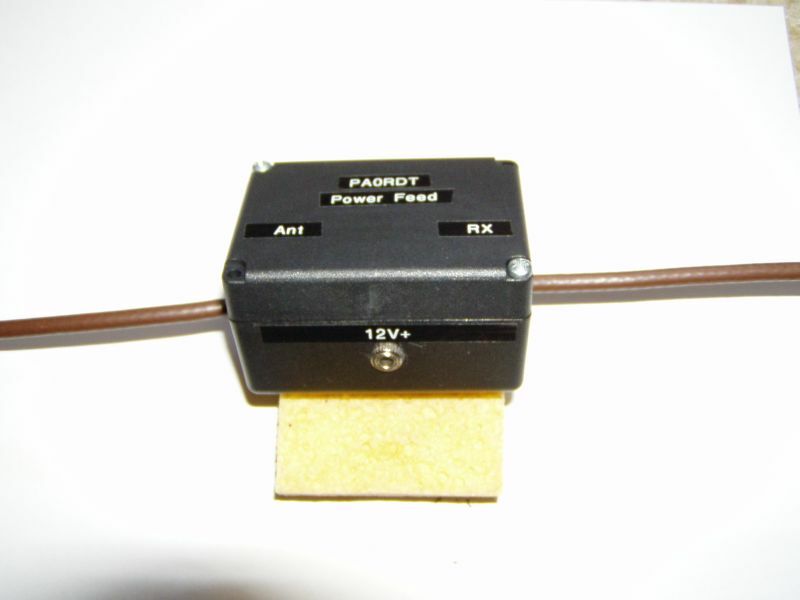 The PA0RDT Mini whip isn't really a whip aerial at all, the aerial being the small oblong pice of copper to the right of the circuit, the whole aerial measures just 5cm x 3cm, boy that's mall and so does it work. Well the tiny signal is amplified by a BF245C N-FET and then buffered with a 2N2219A. These are not the orignal transistors that PA0RDT used but what I had to hand. 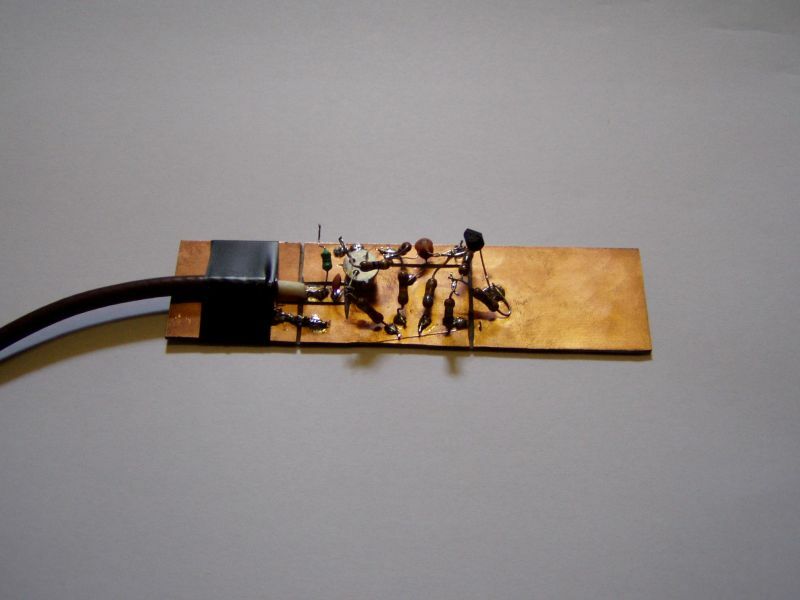 The circuit receives it's power via the coax cable and the little 'Power Feed' box is shown below and supplies 12 volts to the antenna circuit and passes the HF signals through to the receiver. A quick test on Long Wave delivered a number of signals at good strenth with the antenna just propped up on a window ledge, then on to the 40 and 20 metre amateur bands, where it delivered a number of signals on my portable HF3 receiver. I've tried it up in the loft but am a bit disappointed with the results (I know it should really be mounted outside for best results) and have now changed the BF245C for a J310 as originally used by PA0RDT. Performance is better with the J310 and it continues to work well on Long and Medium wave. When compared to my outside FD4 on 40M signals from the mini-whip mounted in the loft are mostly about 4 or 5 S Points down on the FD4 which is pretty good and for some reason it doesn't work well at all with my Funcube Dongle Pro+ but is fine with my FT847 or my HF3 Receiver. On 40M the received signal strengths are very similar to when I connect a 10 Metre dipole to the rig..